I spent the weekend at a very good friend’s house. It was very relaxing and very beneficial. Today after church, we went to her mother’s house for lunch. After we’d eaten, Esther and I took her brother’s two daughters to a nearby playground. During the course of our play, the girls, whose ages are possibly 6 and 4, decided to crawl up the enclosed slide. After this activity’s novelty wore off, they began to slide down backward. The younger went down and Esther caught her to make sure she didn’t hit her head. The elder didn’t slide down backward yet, she was more absorbed elsewhere so Miss Esther and I sat nearby. I’ve admired Miss Esther for a long time. She is one of those people who will never cease to amaze me. This weekend, she, of course, amazed me even further. But this simple story about a playground makes me think about how amazing God truly is. How often am I that child who jumps head first down a slide, then midway into my ride to I shout, “God, catch me!” I often make decisions in my life, everyone does. I decide what clothes to wear, what food to eat, what classes to actually attend. I decide bigger things occasionally as well, like what college to attend, how I should spend my money, and other things. How often do I make these decisions of my own will then halfway into it shout out to make sure God is there to catch me? Though what the elder girl did was not exactly full of wisdom, she exhibited great faith in her aunt when she slid down the slide. She knew that Esther would be there to catch her. Do I have that trust? Do I have that faith? That’s the convicting part of the story. There’s an even cooler part. Esther anticipated the foolish decision on her neice’s part. And she was there waiting at the bottom, anticipating her neice’s need of someone to catch her before she hit her head on the ground. God, who is all-knowing, anticipates my stupid decisions and mistakes and even though I forget to ask him in advance, He’s already there, like Esther at the bottom of the slide, waiting to catch me and make sure I don’t hit my head on the ground. To close, Esther is pretty much amazing. But the God that Esther and I share as Lord and Savior is even more amazing. I know she would tell you so too. I could add another brick, or I could let it fall. Taking down my walls would hurt; I thought that I would die. And so I built it higher; I added bricks each day. My wall became a fortress, I drove everyone away. Eventually my wall took over: all my heart was stone. No one now could penetrate, I was feeling so alone. But then I started thinking: I did this to myself. I don’t know how to fix this then I looked toward my shelf. One book sat there dusty, its cover worn and cracked. You’ll belong to me and I to you: You’ll never be alone. I built my wall up brick by brick, that’s how I took it down. Remembering my solitude brought me just a frown. My life was changing, I let more people in. The change I’d longed for all my life, started to begin. I’m not saying it is easy, I’m human after all. But I know He’ll be there for me, every time I fall. *This was started a while ago. I added the last three “stanzas” tonight. And I finally think it’s starting to be true in my life. Hope you enjoyed it. Side note, the previous entry will be edited soon and another section added as per the requirements of my class. That’s all. Have a great day! As dinner winds down, I hurriedly finish my own dinner so I can help the others scrape the plates and put them in the racks, ready to be washed. Dave, in his paper hat, takes the full racks of plates and cups and runs them through the dishwasher while we clean up the rest of the dining hall. We gather any stray dishes and trays then wash down the tables and the buffets. 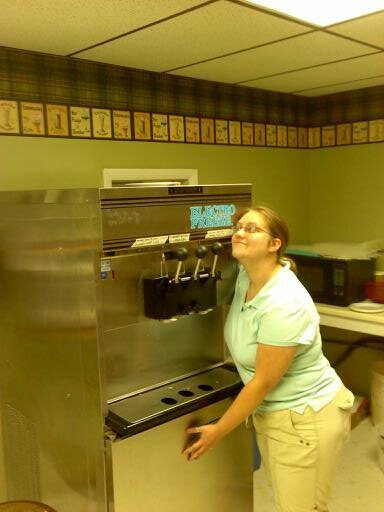 At about 6:15, as usual, Donna comes out of the kitchen to get the snack shop ready for after the evening service. Donna is my boss at Odosagih Bible Conference. She’s in her mid-sixties but she seldom acts it, especially if she has had the caffeine-laden sweet lemon tea she likes so much. Donna is shorter than I am by at least eight inches and to look at her you feel like you could break her if you’re not careful, like the dolls she passionately collects. But she gives the best hugs anyway. She’s also a morning person and for this and other reasons, I call her Sunshine. When I see Sunshine head into the snack shop, I stop cleaning up to help her. This is one of my favorite times of the day. I like working with her, I like helping her, and I like the snippets of conversations that we have about the day, about life, about most everything actually. That, and if I’m helping her I won’t get stuck with garbage duty. If she hasn’t turned on the hot water, I turn on the faucet to let the water warm up. It takes a long time. After six weeks of working here, it’s funny how I know little things about the sinks and such. For example, the snack shop sink takes a good ten minutes to get hot enough to use and I know that I have just enough time to take one pitcher of water to a table while the next fills at the sink with the filter on it. I didn’t really want to work at Odosagih. It’s a campground for old people with a 10:30 curfew and innumerable other rules for their staff. But somehow I ended up here and before I knew it, I could tell you exactly how many gallons of tea you would need for various meals. When the water is finally hot enough, Sunshine hands me the dish that goes on the hot plate to fill while she gets the hot fudge, caramel, and other ice cream toppings. They all go in the hot water so they’re runny enough to use that evening. Even the butterscotch goes in, though Mary Ann insists it’s a cold topping. We took a vote and decided customers would rather have the butterscotch on their sundaes than wait twenty minutes while we try to get it to come out of the squeeze bottle. Unfortunately, the hot fudge is running low and there is no more in the refrigerator. Sunshine sends me to the kitchen to open the can while she gets out all the utensils for the toppings, like spoons for the peanuts and ladles for toppings like peanut butter and strawberries. I return shortly with the open can, a spatula, and a container for the excess. The hot fudge that U.S. Foods sends us is much too thick to pour on a sundae, regardless of how hot you can get it. So we mix hot water in with it. Once, Mary Ann mixed coffee in with the hot fudge. It was repulsive, in my opinion. I can never get the mixture of hot water and fudge quite right, which is why I stand amazed as Sunshine microwaves the fudge and water then stirs it all together. While the microwave is running, I glance at the soft serve machine to see if Sunshine turned it on yet. She usually hasn’t so I do it, making sure to turn the two on the vanilla side to “day” and “on” then doing the same for the chocolate side. It’s important to never touch the middle switch. Once, someone turned it on and we ended up with several gallons of spoiled chocolate soft serve. It was not pleasant. The microwave beeps just as the familiar whir of the soft serve machine is in full swing. Sunshine stirs her mixture until it is just the right consistency. I stand back and smile as she performs the “lift and pour” technique to make sure the hot fudge doesn’t drip as she pours it into the squeeze bottles. We’re almost done with the snack shop and we double check to make sure we have enough ice cream containers and enough forks for the mini pizzas we’ve been selling this summer. By the time we’re done, it’s already 6:40 or so, which leaves us twenty minutes before the tabernacle service starts. After the day’s various activities, I feel disgusting so I head back to my air conditioned room to change my shirt, wash my face, etc. while Sunshine and my fellow employees do similarly. As I take the second bathroom on our floor, I remember to close the door extra tightly because sometimes it doesn’t like to stay closed, another little tidbit I’ve learned over the summer. Once I’m ready and feel clean enough, I head over to the tabernacle building and take my seat, third row up and third seat in, which leaves two spaces on my right for Sunshine and her husband Art (I like to call him Chief) and more than enough room on my left for my coworkers. On nights like tonight, when I’m working in the snack shop, it’s difficult to focus on what the speaker is saying. As I sit there, I wonder how many tables I should set with water. I wonder if the couple working with me will remember to come. Admittedly, I sometimes hope they won’t come so that Chief and Sunshine will be in there with me. I know it’s selfish because they’re usually already tired but being able to spend a little more time with them always makes me feel good. While I listen to the speaker, I wonder how many people will actually want ice cream tonight. As the speaker finishes his sermon and starts to pray, I quietly gather my things so I can get to the snack shop as soon as possible. If Chief and Sunshine are going up, sometimes I ride on the back of the golf cart or in their car if that’s what they have at the tabernacle. If not, I walk as quickly as I can by myself. But tonight they’re talking to some friends from one of their former churches so they’ve given me their master key. I go into the dining hall and start taking care of everything else that should be done before people start coming in. I turn on both sets of lights then I fill at six pitchers of ice water and put them on the tables. No one else, meaning the couple working with me, has come in yet so I go back in the snack shop and turn on those lights before I get out the money box and put on an apron and gloves. Gloves are an interesting part of the snack shop. On occasion, Chief will amuse us by blowing up his glove with his mouth. Sunshine prefers the small size. The men who work there usually like the large. Frankly, I’m a medium person myself but usually those are all gone. I’ll probably go through at least two pairs if it’s a busy evening because they get so sweaty and gross on the inside. I don’t really understand how gloves are more sanitary than my hands. Once they’ve been on for five minutes they’re just as dirty. Finally, the other two people working with me come into the dining hall. I’m relieved. We spend the next hour and a half making sundaes and milkshakes and scooping ice cream. I’m exhausted but ecstatic when it’s ten o’clock and time to clean up. I put the toppings back in the fridge and turn the soft serve machine to “night” and “off” on both the chocolate and vanilla sides. One of the other adults wipes down all the counters along with the tray that catches the drips on the soft serve machine. I clean as quickly as possible, hoping for a ride on the golf cart. It is, after all, a lonely walk back to my room alone at night. I try not to get my hopes up though, in case Chief and Sunshine have already left to go to bed. Tonight, I’m pleasantly surprised to see that they waited for me. I smile as I toss my apron in the basket and walk out the door, usually rambling about something or other to Chief and Sunshine. I hop on the back of the golf cart, hyper not because of ice cream I ate but happy because they care and love me. What is a lonely walk is a relatively short drive and soon we’re outside the building in which I stay. I say my goodnights and add with enthusiasm, “See you bright and early in the morning!” as seven o’clock is, to me, quite bright and quite early. I smile to myself as I open the door to the building and then to my room. I change into my pajamas and brush my teeth for the third time that day. Then I drift off to sleep, the sounds of the soft serve machine and Sunshine’s laughter still echoing in my mind. Either way all I’ll leave is an ugly, dirty stain. Can’t you see I’m covered in grime? Can’t you see I’m a mess? The thoughts in my head don’t even make sense.